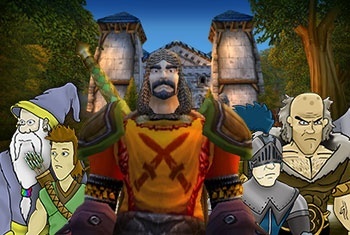 Join Doraleous & Associates in Stormwind, on the Lightninghoof server, July 22nd 4-6pm EST. Last week in the World of WarCraft, Doraleous and his intrepid associates braved the narrow, clammy tunnels of the Deadmines and faced off against the villainous Van Cleef. The spoils of the adventure included one pristine ship, which revealed one small problem: nobody knew how to sail. Despite last week's disappointment, Doraleous and Associates continue to brave the strange, foreign lands of Azeroth. This week, they will be meeting the Horde in glorious battle, face to face, mano a orco. Will you join them? If we cannot muster enough willing soldiers, we shall be venturing into the similarly clammy (albeit, clammy in a different way) halls of the Stockades, the impenetrable prison where Stormwind's most vicious criminals are kept. *In order to participate this week, you must be at least level 20.